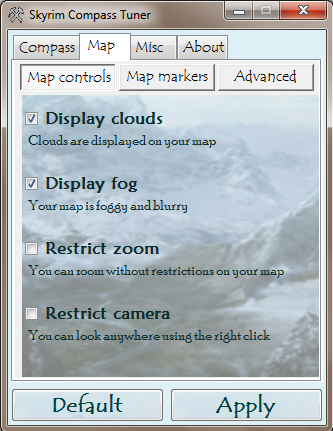 Select what you want to display on your compass, map and hud! I use swfmill, SharpZipLib and IniParser. There is an issue with the last Skyrim patch (1.8), causing all map mods to make the player and quest markers to disappear. This applies to Compass Tuner. I don't think I can do anything about this for now. I'll just wait and watch how the situation evolves. This is a game bug, really. 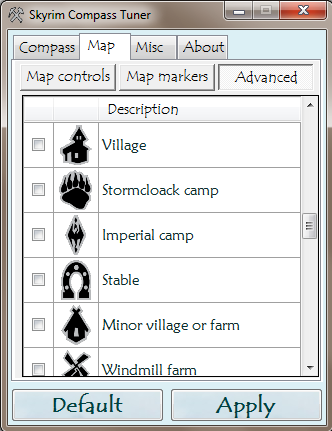 If you still want to use the compass and hud features of Compass Tuner, you can delete your "map.swf" file, located under "Data/interface" from your Skyrim installation folder. Just keep in mind that this file is re-created each time you launch Compass Tuner, and even if you don't change anything, even if you don't apply settings, the issue will still appear. Skyrim Compass Tuner is an interface allowing you to easily customize your compass. Just select what markers you want on your compass, and get rid of the rest! Since version 2.0, you can also customize your in-game map! If you have any problem and can't find a solution in the short list below, be sure to post a comment or contact me. I'll try to help you to get things sorted. 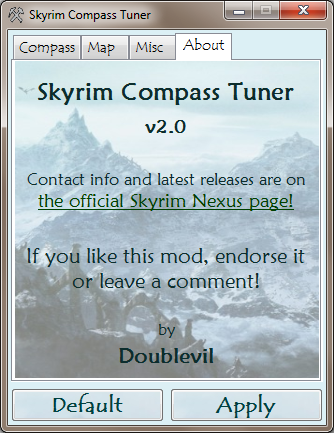 Q: How do I install Skyrim Compass Tuner? A: Once you downloaded the file from Skyrim Nexus, extract it (right click, extract) to any location you want. This will create a folder named "Skyrim Compass Tuner". Just launch the executable from here. A: If you encounter an "initialization error", download the .NET Framework here, install it and try again. In other cases: Make sure all the files contained in the downloaded archive are together. Delete the files and re-download the mod if necessary. If the problem persists, make sure you have the last Windows Service Pack installed for your system. Contact me if nothing works. Q: When I hide the quest markers on my compass, it also hides floating quest markers! A: This is a known issue, but I can't resolve it for now. The game uses the same resource for both markers. Sorry! Q: When I hide markers on the map, labels still appear when hovering hidden elements. A: This is a known issue. I'm trying to fix it. Q: After applying the configuration, map control labels disappear. A: This is due to a problem with swfmill (an external tool that I use). I can't fix it for now. Q: I cannot seem to hide the stealth indicator or/and the enemy health indicator. A: This is fixed in the last 2.1b version. Q: Texts are too big to display properly on the window. A: Go to the CONF tab and check "Allow window resize". Then resize the window in order to have all the controls usable. Q: How do I uninstall Compass Tuner? A: Open Compass Tuner, click Default and Apply. If you want to fully uninstall it, you will, in addition, have to go in your Skyrim/data folder and delete the files Interface/map.swf and Interface/exported/hudmenu.gfx. Q: I upgraded to version 2.1 and it's still incompatible with the mod "A Quality World Map". A: In fact, the incompatibility is due to a line in Skyrim.ini, located in your documents, in the "My Games/Skyrim" subdirectory. 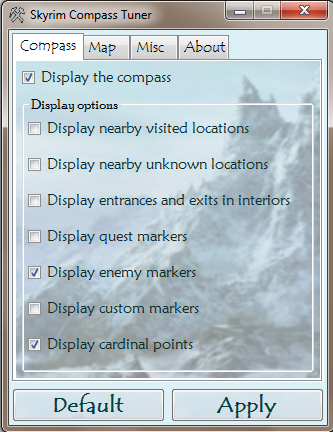 Skyrim Compass Tuner used to add this line in certain cases, which prevented compatibility with A Quality World Map. Just delete the line beginning with "uLockedTerrainLOD=", save the file, and it should be done. I'm not really working on Compass Tuner anymore. I may decide to release an update to fix issues or to add requested features, but don't expect too much new features. A nice thing to do, as suggested by devthewild, would be to tweak the map so it doesn't show at all the player location when disabled (i.e. tweak the mouse pointer showing the location and the map centering). And there's an issue with the "remove stealth indicator" option. A trace of the indicator still appears when detected. Thanks Wubbledee. I may fix this in the future. Added an option in the "CONF" tab to prevent Compass Tuner from modifying the map interface file. Full compatibility with the mod "A Quality World Map"